Kensington Palace has been a favourite royal residence since the late 17th century. It was the final residence of Diana, Princess of Wales. Today it is home to two royal couples who truly demonstrate love and commitment – the Duke & Duchess of Cambridge, Prince Harry and his fiancée Meghan Markle. The apartments where they live cannot be visited but the historical rooms of the palace are open to the public. There are stories of the previous inhabitants including Princess Victoria. Stand in the same room where she was told in 1837 that following the death of her uncle William IV, she was now Queen. 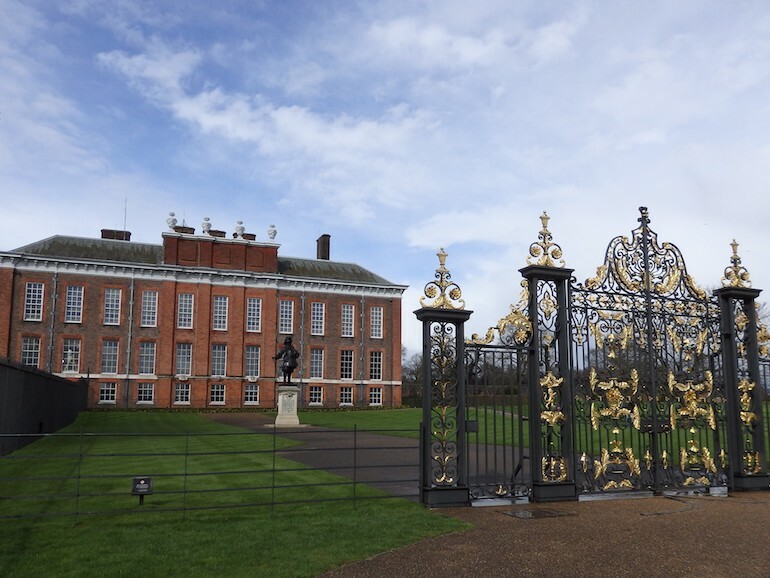 Golden Gates and entrance to Kensington Palace. Photo Credit: © Angela Morgan. Windsor Castle – the oldest and largest occupied castle in the world, a royal residence for more than 900 years. For the most part Her Majesty Queen Elizabeth treats this as her main residence. Within the castle, precinct stands St George’s Chapel which was the venue for Prince Harry and Meghan Markle’s wedding 19th May 2018. The State Rooms are opened to the public; visitors pass through rooms displaying artwork, furniture, weaponry, diplomatic gifts and unusual items that form royal collection. Once outside of the castle a wander along the town’s high street will lead to the Guildhall where in 2005 Prince Charles and Camilla Parker-Bowles were married in a civil ceremony. 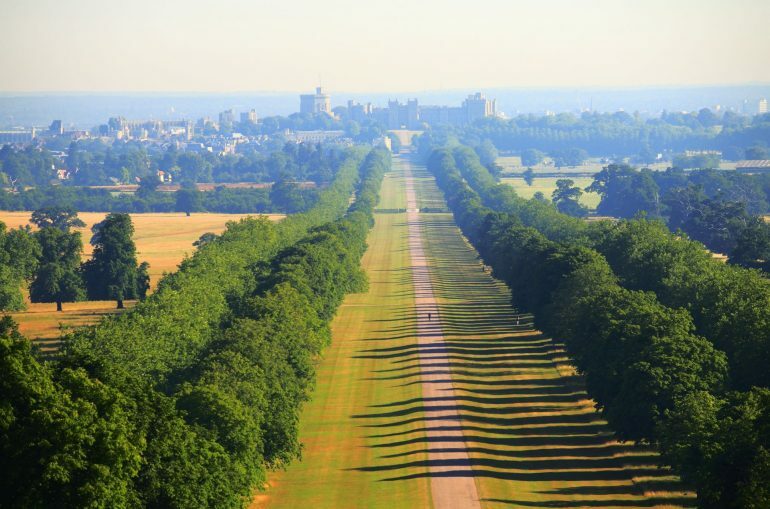 A real treat is to see the Long Walk which leads from Windsor Castle into Windsor Great Park which is opened to the public, the view from the castle gates is stunning. Take a photo in front of the gates with the Castle in the background. Friends may think that you are showing off your new home or it’s the hotel where you are staying! The Long Walk towards Windsor Castle in the distance. Photo Credit: ©Pawel Libera via Visit Britain. • There is something about standing on a bridge enjoying the views that makes it’s a special experience. Standing on one of London’s famous bridges –day or night offers a view of the city skyline that is magical and romantic. Westminster Bridge, Tower Bridge, Waterloo Bridge, or the Millennium Bridge offer different views; watch the riverboats travel along the River Thames. 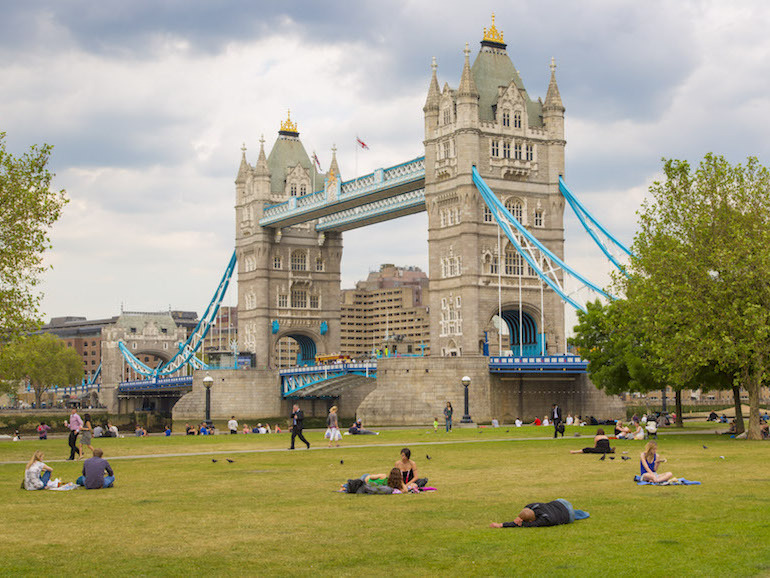 On either side of the bridges, take a stroll along the embankments heading east or west; stop for a drink or dine alfresco in one the pubs or restaurants that are close to the river. View of Tower Bridge in London. Photo Credit: © Pawel Libera via London & Partners. Royal parks offer a chance to enjoy green space far from the busy noisy London streets. Previously hunting grounds for the Royals, the parks are enjoyed by Londoners and visitors alike. Leisurely pursuits such as walking through St James’s Park watching the wildfowl and a view of Buckingham Palace from the blue bridge; Hyde Park for biking, horse riding walking by the Serpentine etc. Hyde Park is also one of the best places to watch the Horse guards riding to or from their guard duty at Horse guards, Whitehall. Kensington Gardens is where the beautiful and moving Albert Memorial is located facing the Royal Albert Hall; both are a testimony of the deep love and affection Queen Victoria had for her “dear beloved” husband Prince Albert. London Royal Parks: Couple walking at the edge of The Serpentine in London’s Hyde Park. Photo Credit: © London & Partners. Riverboat rides – you can combine your walk in London with a boat trip on the River Thames. Enjoy a wonderful river view of buildings such as Houses of Parliament, St Paul’s Cathedral, the Tower of London and the Royal Naval College Greenwich. There are Thames dinner cruises that offer dinner and dancing as well as seeing London by night. 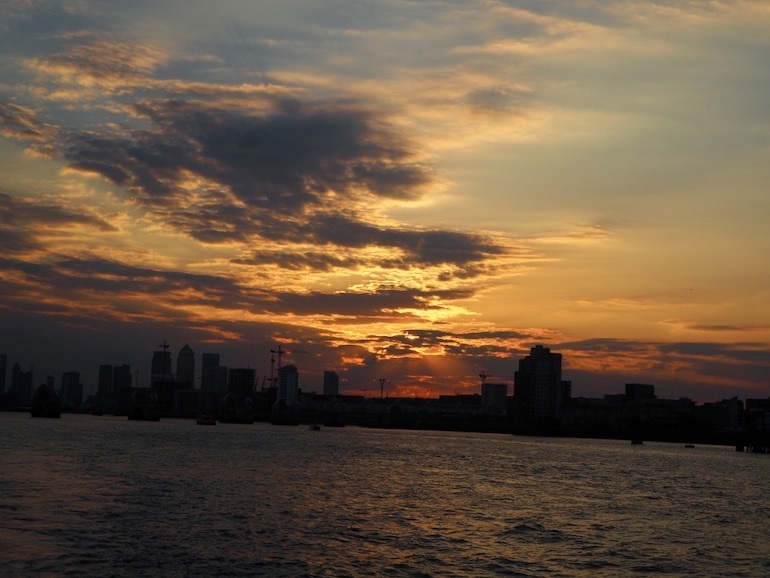 Watching the sunset while on a River Cruise in London. Photo Credit: © Ursula Petula Barzey. Mayfair and St James’s are districts in London’s West End. Both are known for the small exclusive shops selling luxury items. Mayfair is the location for some of the best-known fashion houses such as Louis Vitton & Alexander McQueen; jewellery and luxury gift shops such as Aspreys & Boodles are interspersed between designer boutiques. The St James’s district has a number of shops for the discerning gent offering tailored or off the peg suits, stylish cuff-links, and ties etc. Some of the shops have been in business on the same site for more than 280 years such as Floris perfumery, Lock & Co hat makers and Berry Bros & Rudd wine merchants. They hold Royal Warrants which means they provide services or goods to the royal household. Fortnum & Mason is situated on Piccadilly; it is sometimes referred to as the Queen’s grocer. After shopping or strolling through the area, why not visit and enjoy afternoon tea in the Diamond Jubilee Salon. There are several restaurants in the area, some are frequented by the rich and famous such as Quagliano’s – Queen Elizabeth II made history by dining here in the 1950s. 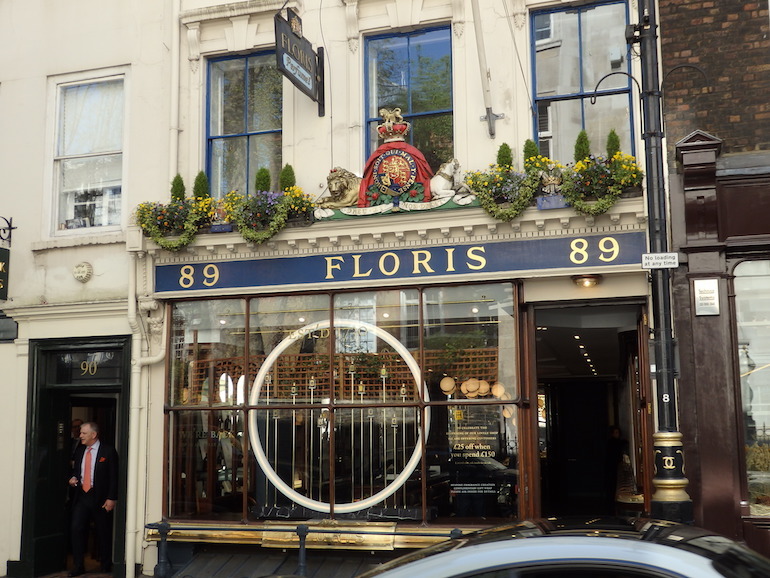 Floris London_British Family Perfumers Since 1730. Photo Credit: © Angela Morgan. 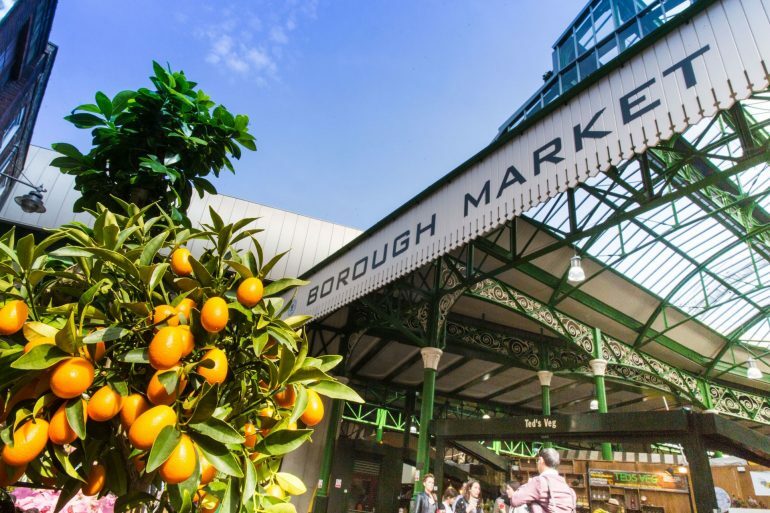 Borough Market – enjoy oysters and champagne at the oldest market in London. Situated at the end of London Bridge, this market attracts foodies. There are street food stalls offering a variety of hot meals. There are other stalls and shops that sell artisan bread, cakes, sweets, fruit and vegetables, cheeses & truffles and much more. Almost every palate is catered for. Entrance to Borough Market near London Bridge in London. Photo Credit: © London & Partners. 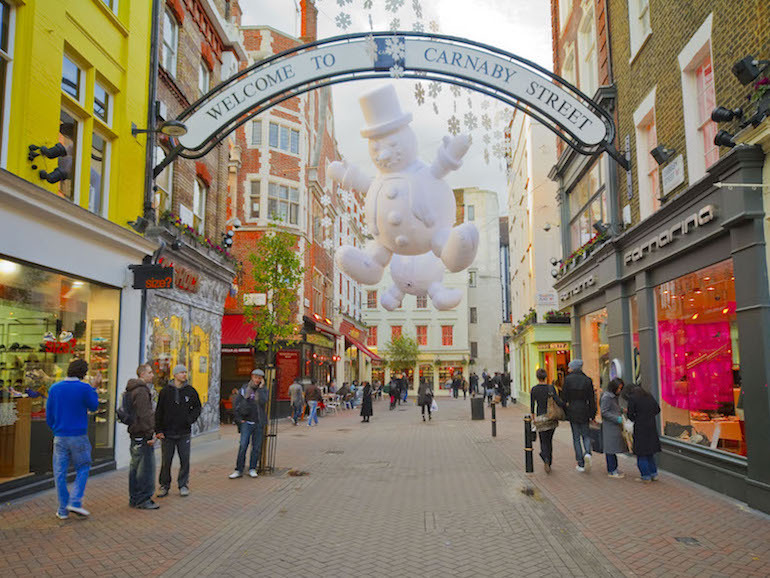 Carnaby Street in Soho was made famous in the Swinging 60s and mentioned in the Austin Powers film (“Yeah Baby!”). 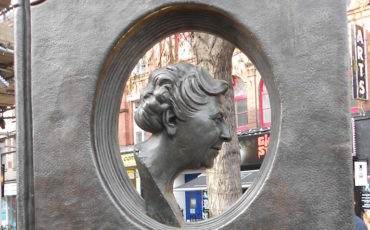 It is situated behind Regents Street. It is a vibrant, colourful and exciting place to visit. A large street sign welcomes visitors to this shopping street. Independent stores selling unique clothing styles attract shoppers who want to stand out. The Newburgh Quarter is known for its jewellery shops that offer unique handcrafted pieces of jewellery that have attracted celebrities such as Johnny Depp, Aerosmith, Kate Moss, and Naomi Campbell. Kingly Court is a food court that is very popular for eating and socialising or even just to take photos of the 3-tier courtyard. Carnaby Street in Soho area of London. Photo Credit: © London & Partners. Why not consider drinking champagne whilst having unparalleled views of London? The Shard is just the place. At 1017ft it is currently the tallest building in Western Europe. 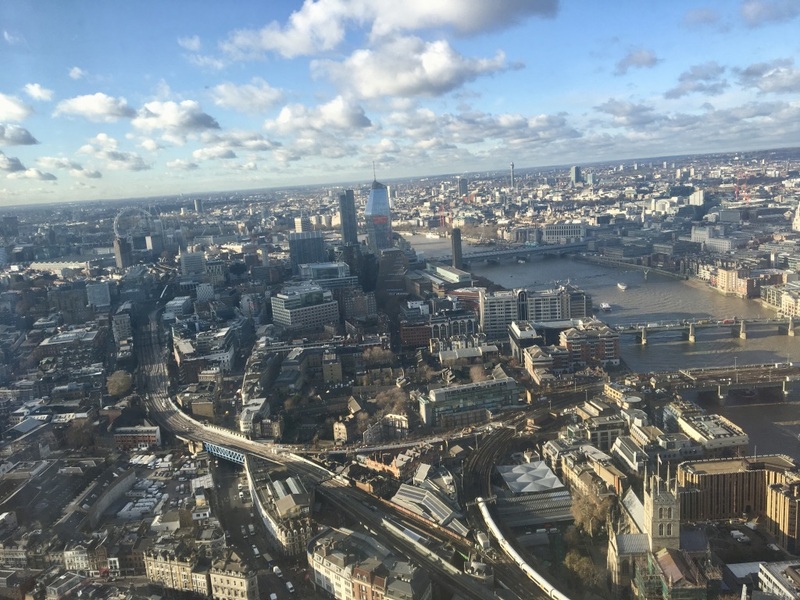 From the viewing platform on the 69th floor, major sites such as the Tower of London, Tower Bridge and the buildings in the City of London such as the Gherkin look spectacular. The Shard has a hotel, cocktail bars and restaurants where views of London are also just as stunning. View across London from one of the rooms at Shangri-La Hotel on the 45th floor At The Shard. Photo Credit: © Ursula Petula Barzey. 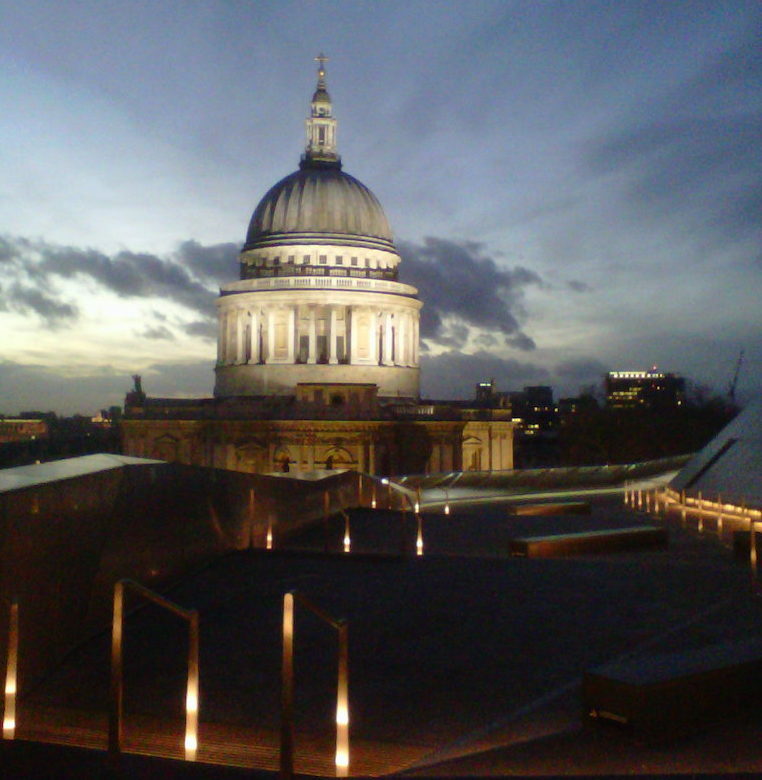 One New Change – this shopping centre offers not just a restaurant on the roof but a view of the dome of the most famous church in the City of London – St Paul’s Cathedral. Built after the Great Fire of London in 1666, this church was the venue for Prince Charles’s marriage to Lady Diana Spencer in 1981. View of St Paul’s Cathedral Dome from the roof of One New Change Shopping Centre. Photo Credit: © Angela Morgan. The London Eye originally named the Millennium Wheel opened in 2000. 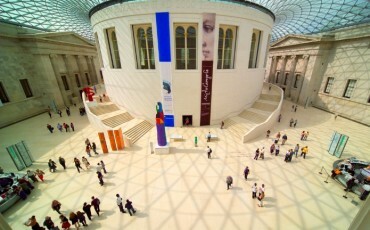 Today it is one of the most popular tourist attractions. They offer rides in one of the 32 pods (that holds 28 people). At 443 ft there are views of London with the familiar sights of the Houses of Parliament, Westminster Abbey, St Paul’s Cathedral and the Shard. The London Eyes offers the Champagne Experience where you can enjoy a ride in a specially designated pod and have a glass of champagne. The London Eye also has a special licence for civil ceremonies and weddings. 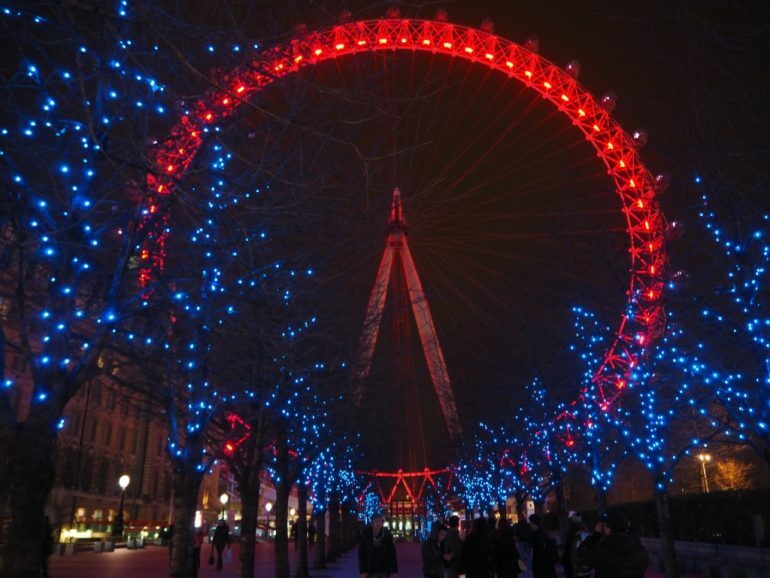 London South Bank – A view of the iconic London Eye at night. Photo Credit: ©Ursula Petula Barzey. 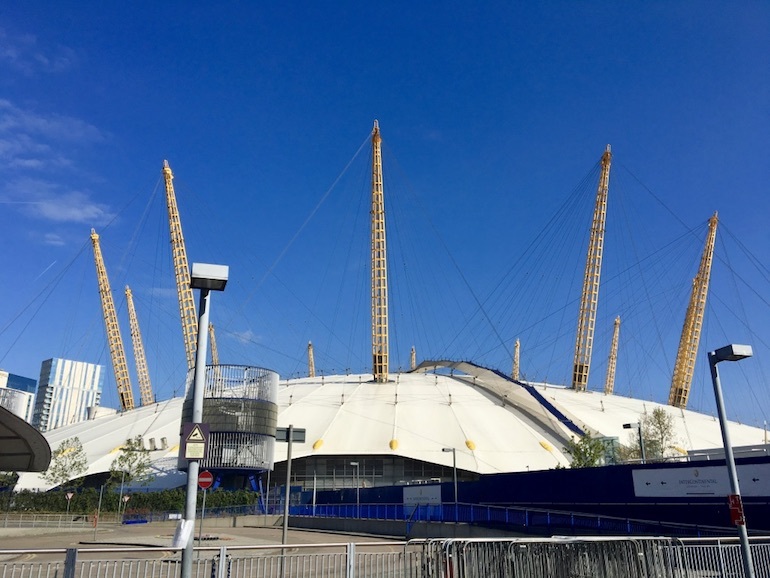 The O2 Arena in Greenwich is the former Millennium Dome that opened in 2000. It is now the most successful events arena in Europe. Why not take a roof walk. You will climb to the top of the Dome. 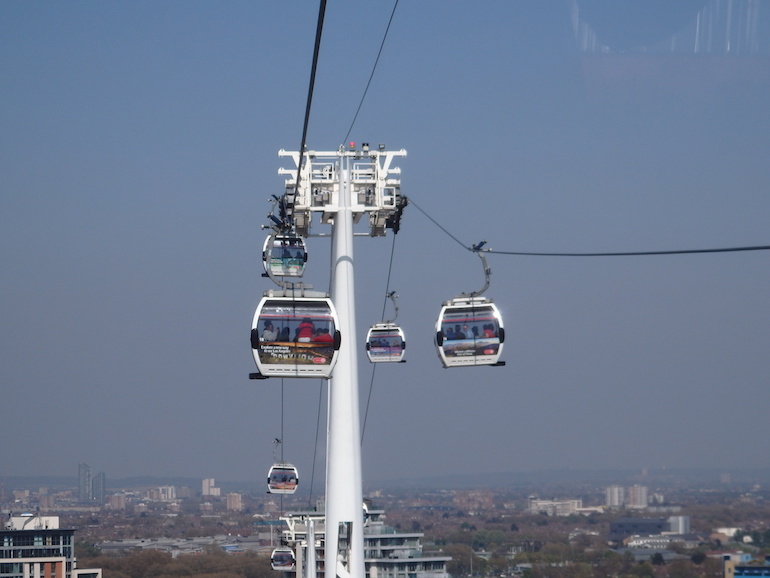 At approximately 154ft (52m) it offers a breath-taking view of London including Canary Wharf and a glimpse of the Olympic site. Not for the faint-hearted but it would be a special shared experience. O2 Arena in Greenwich. Photo Credit: © Ursula Petula Barzey. The Emirates Air Line Cable Car the latest form of public transport that crosses over the Thames from the Greenwich Peninsula to the Royal Docks offering great views of London. After 7 pm, enjoy extended Night Flights (12 to 13 minutes each way) with music and video in cabins to enhance your experience as you watch the city come alive after dark. Emirates Air Line cable car. Photo Credit: © Angela Morgan. 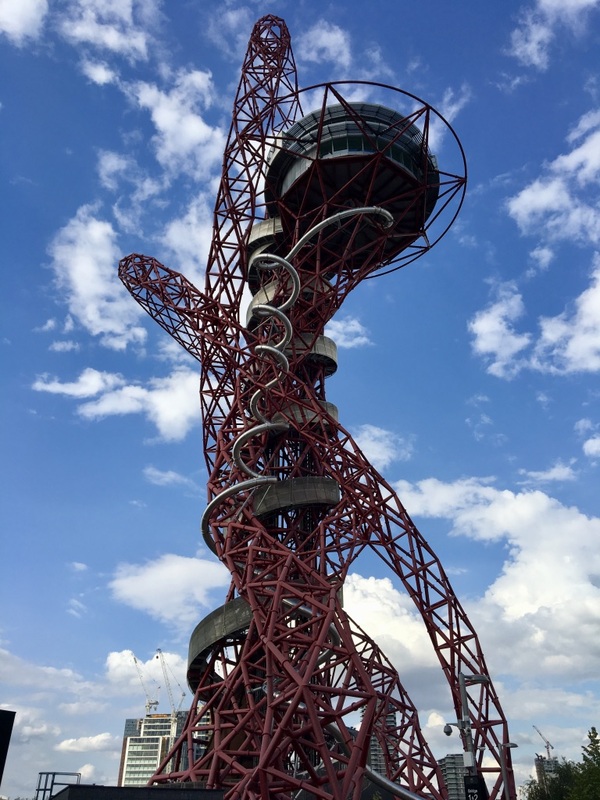 The ArcelorMittal Orbit is the United Kingdom’s tallest public artwork which also includes the tallest and longest tunnel slide in the world. Anish Kapoor created this unique metal structure. The slide has 12 twists and turns and a 164ft (54m) straight run to the ground. To get the adrenaline pumping, take a 40-second ride on the slide. The speed of the journey down the sculpture is up to 15 miles per hour (24km per hour)! The sights of London will go by in a flash! 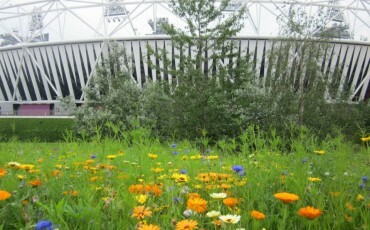 Closeup view of ArcelorMittal Orbit in Queen Elizabeth Olympic Park. Photo Credit: © Ursula Petula Barzey. These are some suggestions for having a romantic day in London. When you hire a Blue Badge Tourist Guide he/she will tailor the tour to your exact needs. You will bring the romance and love to make your day or visit a very special occasion.